Even if you’re not a techie you’ve probably heard about VPNs (virtual private networks). Basically, a VPN allows you to browse the web anonymously by hiding your IP address. However, VPNs have evolved and now offer more features. One of those that has really caught a lot of people’s attention is PureVPN. On the surface, it looks like PureVPN is not that different from other VPNs. Once you’re connected, you go through its encryption system so you’ll be anonymous. But is PureVPN really going to protect you from hackers, government spooks, and advertisers? After reviewing PureVPN, the answer is a clear yes. Unlimited data transfer: there are no restrictions on your bandwidth regardless of the account you choose. Unlimited Server Tracking: you can change servers as often as you want no matter what account you use. Security Protocols: it has support for Open VPN, IKEv2, SSTP, L2TP, PPTP, and Stealth. No speed throttling: most Internet service providers throttle your speed so you don’t get the full benefits, but with PureVPN even your ISP won’t see you, allowing you to take full advantage of its speed. PureVPN offers support for Mac, Windows, Linux, iOS, and Android. It also supports Chrome and any device that is Internet-powered. Chrome support comes in the way of a plugin which provides security for web traffic. This blocker also functions as an ad blocker and keeps ad trackers off your back. It even fights off malware so that’s another plus. While the anti-malware feature is nice, it is not meant as a replacement for your antivirus program. PureVPN does not conflict with that and they should be used together. The plugin also blocks WebRTC bugs and prevents websites from accessing your webcam. By installing PureVPN you’ll be protected. In addition to these, PureVPN also has programs for streaming devices and routers. This is a convenient feature because it extends the VPN protection for other devices in your home without spending a lot of money. One of the most common problems with VPNs is they don’t improve, so it’s nice to see an established name like PureVPN look for ways to improve. It keeps track of possible threats by maintaining blacklists of trackers, advertisers, and malware. PureVPN also provides BitTorrent and P2P file sharing support on many of its servers. P2P support is not always present in these devices so it’s refreshing to see they’re here. By using Its Split Tunneling lets you choose particular types of traffic to go in the VPN. This enables you to ensure specific actions are secured while less sensitive functions have full access. After you have connected to the PureVPN server, it will connect you to the fastest server near you. If you’re not happy with the speed it is easy enough to change, giving you lots of flexibility regardless where you are. Even if PureVPN does not have as many servers as others they are more reliable. One of the long-held truths with VPN usage is that it will slow your Internet sessions, even by just a bit. In the case of PureVPN that isn’t true. In various tests, it does not slow down your Internet but actually improves download speed, often by a significant amount. Internet browsing and download speeds are affected by many factors such as the server quality, the speed of your service provider, the website itself and so on. But all things being equal, PureVPN outdoes the rest when it comes to performance. Latency increases only by 6% using domestic servers which is at par with other quality VPN servers. However, it crushed the rest of the field by speeding up downloads by up to 346.5%. which is something you won’t normally expect with VPNs and is a pleasant surprise. So how is this is possible? One reason is that most Internet service providers throttle the download speed. But since you are invisible, your ISP won’t be able to do this so you benefit from a faster speed. Upload speed slows down a little by 5% on average, but that is par for the course when it comes to VPNs. PureVPN also does well in international speed tests: latency increase is minimal and download speed shot up to 403%, which is nothing short of remarkable. Every VPN claims that it is fast, but you will be hard-pressed to find one that offers the kind of performance that PureVPN does. Because VPNs tend to slow Internet speeds, what users look for is the minimum amount of speed slowdown. With PureVPN, your Internet speed actually increases by a significant margin. If that’s what you’re looking for, there is no other choice. The client itself is also faster than previous versions. The app makes good use of images, and it is more convenient to use than others. When you are connected you will see your session duration, the IP address you’re using and connection status. With all these features it’s easy to keep track of what’s happening as you browse. PureVPN installs quickly in different platforms and systems. You need to create an account with PureVPN for billing and then input your email and a 12 character password. This is not the password you will use to log in the system as what you get is an email with plaintext username and password. This is also how other VPN services work, and it’s a good idea because it keeps your usage and payment details separate. It may seem a little confusing at first but you will get used to this and it’s an added level of anonymity. When you launch the PureVPN app you’ll have to choose from the following: Remote/Dedi IP, file sharing, security/privacy, Internet Freedom, and stream. Security and privacy is the “default” option if you just want to browse the web anonymously. The Internet Freedom meanwhile, is if you are in China or want to watch Netflix. The Protocols menu lets you choose from the available options and each protocol has a security and speed rating. You can decide what protocol to use, though PureVPN automatically selects one by default. The Global Map option allows you to override the recommendations and choose the server you prefer. As is indicated in the Servers section, PureVPN provides you with a lot of options so finding a fast server won’t be hard. PureVPN supports many platforms but they all provide the same level of security. It supports SSTP, Open VPN, PPTP, L2TP, and IKEv2. Each of these protocols offers 256-bit encryption minus PPTP which uses 128 bits. Support of Open VPN is a nice touch because it is open source, reliable and quick. Of course, if you want to use the other protocols they are available as well. PureVPN hides your IP address so any advertiser or attacker won’t be able to see you. The service does not log your activities or the sites you visit either. You can also access banned websites using any of its servers without fear of being detected. PureVPN does not provide access to the Tor network but it has no effect on security or privacy. It must be said that the PureVPN HQ is in Hong Kong. This might be a cause for alarm for some given Chinese restrictions on web usage. However, Hong Kong does not have data retention regulations so VPN services are not required to store user data. Most VPN today do not put any ads in their user web traffic and PureVPN is no exception. The company also doesn’t make profits from your web traffic. PureVPN doesn’t get in your way: all it does is provide privacy while you browse and for many users that is all they want. As was pointed out in the Features section, there are a lot of options and elements you can configure. But if you just want to be safe, anonymous and secure without hassle, PureVPN is the way to go. 2 years for just $2.95 a month. 6 months for $8.95 for savings of 18%. Each of these price offerings has a 7-day money back guarantee. Basically, you get to try the service for a week and if you’re not happy, you get your money back. There is also a PureVPN business edition which is priced per seat. The cost is $49.99 a month, good for 5 accounts. For 10 users it is $99. For 15 accounts it is $84 monthly. 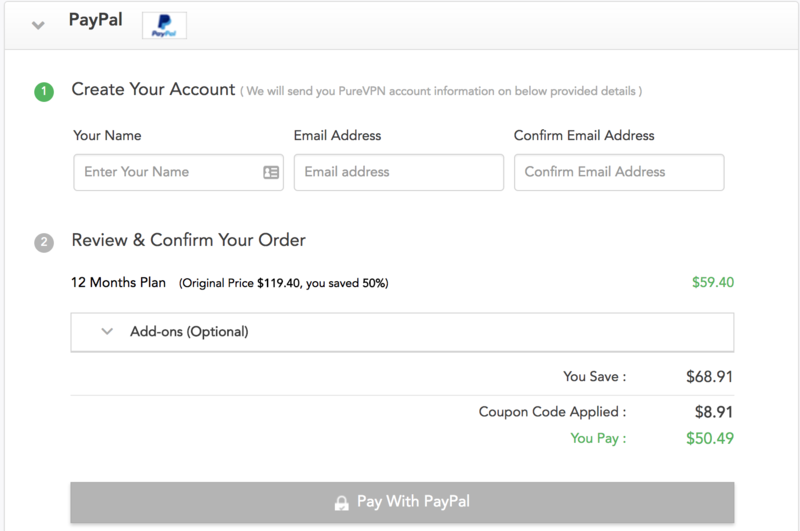 The business version of PureVPN also provides custom pricing if you’ve got a large company. Once you have decided which plan to go with, you can pay via PayPal, Alipay, PaymentWall, an assortment of coin payments including Bitcoin, Cashu, gift cards etc. In other words, you won’t be lacking in options if you want to keep the transactions private. With so many crypto-currencies, credit cards and gift cards, PureVPN is hard to match for comprehensiveness. While it does not have a free trial or a free version, it’s not a big loss because of the money back guarantee. What’s really nice is you get access to all the features no matter what payment option you choose. You also get to choose from various billing cycles so it is easy to find one that suits your budget. After you have finished your transaction, PureVPN gives you the option to add more features such as a dedicated IP address and a NAT firewall. These add-ons are explained in detail so you will get an idea if they’re something you want or not. You get five licenses to use for your devices. No option for quick start. PureVPN offers a comprehensive customer support. There is live chat available to answer your questions, and there is email too. The response to customer inquiries is quick. The support center on its website also provides a lot of useful information. If you are having problems with PureVPN you might want to look into the knowledge base as it contains a lot of useful information that could resolve your problem. There is also a detailed setup guide for Windows, Mac, iOS, Linux, Android, Open VPN and other devices. Other useful information on the support center explains how to use a kill switch, finding a fast server, use dedicated IPs and more. There is also a FAQ (frequently asked questions) which should be a lot of help for new users. What all this means is that with PureVPN you will get a lot of help. So while you will get a lot of assistance from customer support, it is a good idea to check here because the answers you’re looking for may be right here already. Whether you’re a businessman, journalist, activist or just your typical web user, there is no question you need privacy protection when you are online. You never know when cyber attackers will strike and who they will target, so it is best to be prepared. And the best way to protect yourself is by using a VPN. PureVPN faces a lot of competition, but it holds up thanks to the comprehensive package. Basically, it comes with all the stuff you need to browse the web safely and anonymously. Not only that, but in terms of speed, it is one of, if not the fastest VPN out there. If you want optimum protection and anonymity while retaining speed, PureVPN is as good a choice as any.